The New Year is usually a time of reflection about the bigger picture in life, a time to set goals and to visualize the year ahead. 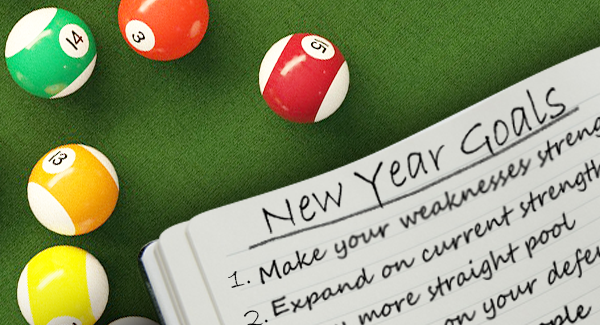 If you love the game of pool, take a little time to apply this deep thinking to enjoy the heck out of this year in the poolroom. Here's a look at five of my favorite “big picture” goals and how they can inspire you to make this the best year yet! 1. Make your weaknesses strengths. Quit avoiding those shots you're “just not good at.” Part of the reason hated shots pose a challenge is that you have a lot less experience with them as opposed to shots you like and therefore opt to play regularly. Put long-term results over the short-term, allow yourself some room to experiment while playing, and even overuse your worst shots as a way to learn more about them and where they fit into the game. Hate the side pockets? Consciously choose playing shots in side. Afraid of cut shots and always go for the bank? Slice away. As always, the quickest way to get comfortable with a new shot is to take some time to practice alone, setting up the scenario again, and again, until you get it. 2. Expand upon your current strengths to become a specialist. Do you have super-human powers of draw? Don't just delight in how far you can bring the ball back, take it to the next level by perfecting your speed control, drawing the ball back consistently to different distances from different distances. Do you have a very hard break at your disposal? Research as much as you can about the break online or in books and work with different speeds, aims and cue-ball placement to learn to control your power. Use your brain to exploit your natural talents and see if you can evolve into the resident expert. 3. Play more straight pool. Nothing will take your game farther faster than learning this great game. Pick upPlay Your Best Straight Pool by Phil Capelle and dive into the fundamentals. You'll be called upon to make most every type of shot and position play, from barely touching a ball to slamming in the break ball.Straight pool can be played against an opponent or by yourself. To practice on your own, set up an easy break ball and break open the rack seeing how many balls or racks you can pocket in a row. 4. Invest time on your defensive game. Once you get past the psychological aversion to defensive shooting and realize it for the crucial element it is, you aren't magically going to become a defensive champion overnight. Playing good defense requires work! The speed of your stroke and the types of hits required to play defense can be overwhelmingly foreign to players when they first try changing up their games. A defensive shot taken and botched can lead to the erroneous belief that it was the wrong shot, instead of a shot that just needs more practice. Good defense isn't a cop-out that's easier than going for offense, it's a well-honed skill and a thing of beauty when done correctly. Frank Says: "If you’re looking to get someone into the game of pool but don’t know how, why not start them off with a PoolDawg Gift Certificate? Let them pick out some stuff they’ll like!" 5. Bring new people to the game. Pool is a game that can be enjoyed for a lifetime, so give someone the gift of learning to play. If you endeavor to explain the game to someone else, you'll end up learning a lot about your own game. We players already know that pool is a lot of fun, bring a friend or family member to play and show them the ropes so that we can all have fun together!